I was recently given the Great British Puddings recipe book as a gift. It’s full of lots of pudding recipes including old favourites as well as some more traditional forgotten recipes. It has a good mix of pies, puddings, cakes and other dessert recipes. There are also a good picture to recipe ration, which is always nice to see. 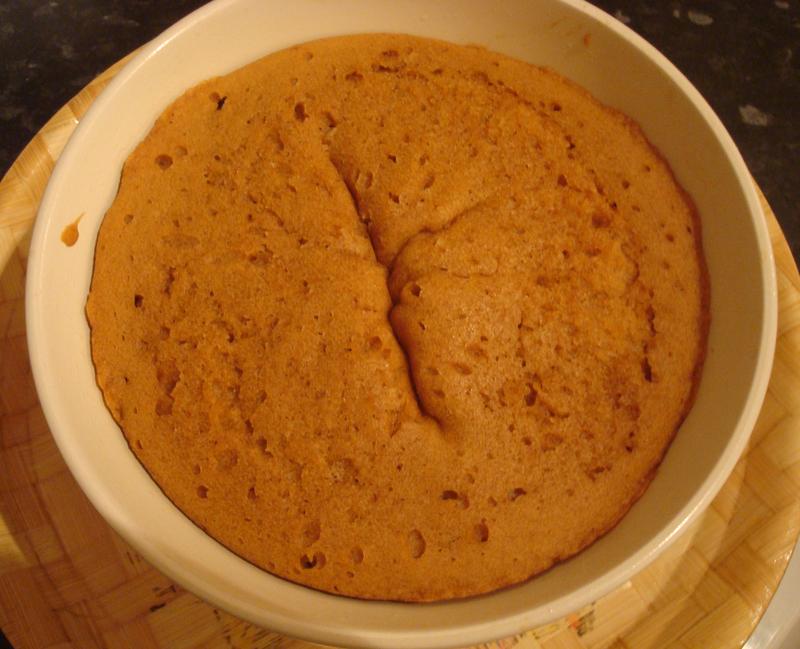 I decided to try the Ginger Syrup Pudding recipe for our Christmas Day pudding. Its a moist pudding with a warm ginger flavour that’s just right. This doesn’t take any longer to prepare than a your regular sponge cake. You will need a 1.1l pudding bowl or a heatproof pyrex bowl of the same size. 1. Firstly, prepare your pudding basin by greasing it with a little butter. 2. Using a mixer or a wooden spoon, beat the butter and sugar together until they’re pale and creamy. Even with brown sugar this mixture will go pale, so keep beating until you get there. Add the eggs one by one, making sure each egg is well incorporated before adding the next one (about 20 seconds). 3. Sift the flour and ginger into the creamed mixture 1/3 at a time using a rubber spatula or a large serving spoon to gently fold into the creamed mixture until there are no traces of flour. Add a tablespoon of the stem ginger syrup to the creamed mixture and stir until incorporated (about 20 seconds). 4. Pour the golden syrup into the bottom of the pudding basin and add the chopped stem ginger. Then spoon the sponge mixture on top of the syrup. Seal the pudding basin by using a length of string to hold a foil and baking parchment lid in place. If your pudding basin comes with a lid you can use that. Make sure you use a layer of parchment paper (closest to the cake), then a layer of foil on top of that. Be sure to make a pleat in the parchment and foil lid to allow room for the cake to rise. I’ve put some pictures below to demonstrate, but if you’re still unsure please click this video link. 5. Place your pudding basin into the pot and cover the pot with a lid. Steam the pudding for approximately 2 hours, it may need a little longer. I baked mine for 2hrs 15mins. NOTE: When steaming the pudding, you must make sure the pudding basin isn’t touching the bottom of the pan. Place a ramekin, jam jar lid – basically any disc shaped (heatproof) object in the bottom of the pan and rest the pudding basin on top of that. 6. Once the pudding is cooked, it be well risen and feel firm to the touch, even through the foil lid. Remove the lid and turn the pudding out onto a plate. It should slip out quick easily, but give the bottom of the basin a firm tap if needed.